Each life-sized (over 12 inches long) lobster-shaped cookie is detailed from the giant claws down to the spreading fantail. Baked in a coastal Maine farmhouse kitchen, each Gingerbread Lobster cookie is hand-formed from a pound of delicious gingerbread dough. Only the best ingredients, including freshly-ground spices, (no nuts) render what many Mainers, as well as tasters "from away," claim to be "the best gingerbread ever!" A Gingerbread Lobster is the perfect gift for birthdays, anniversaries, house-warmings, thank-yous, or holidays. 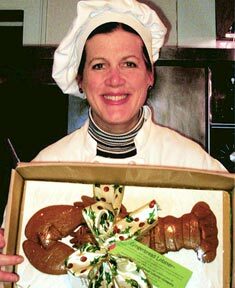 Businesses send Gingerbread Lobsters as a signature gift that is anticipated year after year. Corporate multiple orders can be customized with logo imprints or cards.